Most Linux distributions are shipped with ss and many monitoring tools. Being familiar with this tool helps enhance your understand of what’s going on in the system sockets and helps you find the possible causes of a performance problem. How Do I Filter Sockets Using TCP States? bucket : Show states, which are maintained as minisockets, i.e. time-wait and syn-recv. big : Opposite to bucket state. How Do I Matches Remote Address And Port Numbers? How Do I Matches Local Address And Port Numbers? How Do I Compare Local and/or Remote Port To A Number? Note: le, gt, eq, ne etc. are use in unix shell and are accepted as well. Note: Both outputs are taken from reverse proxy acceleration server running on RHEL 6.x amd64. See ss command help page. astonishing. years of unix administration and never stumbled across this goodie? OK, where the HECK is this thing? I can’t find source, webpage, RPM, etc. Having a link within the article is appropriate. It is part of iproute package. Yummy, thanks for sharing! And ss is included in CentOS 5.2. Thanks for sharing this great tool. I’m loving it. 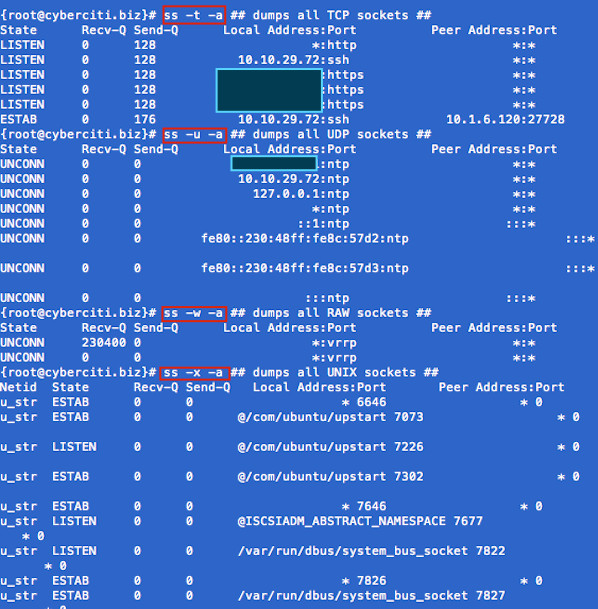 I really appreciate you guys for sharing your knowledge of linux commands for admin type of commands that come in handy for checking out your network and activity, and open tools for open ports.once again thanks. These are some great tools. Thanks for keeping up posting the stuff I need to get things done. In the last speed tests you should add -n so DNS resolving doesn’t slow down the commands. In my testing ss was at least 10 times faster than netstat. Your “time” commands are unfair. Almost all of the time consumed by netstat, is consumed by doing reverse DNS lookups on every IP returned. If you run the netstat command first, it will prime your DNS cache, and then the subsequent command will run faster (whether that be netstat, or ss). I suggest you try the test again using “time netstat -nat”. Adding the “n” will stop the reverse DNS lookups, and the response should be nearly instantaneous. Waiting two minutes for a netstat response would drive me nuts.